Important: These are not plans for making this yourself. These are the directions that came with this trick when it was on the market for $1200.00 in the early 2000s. This PDF is designed for collectors who may have the prop, but no directions, magic historians, and those simply curious as to how this trick was done. The trick still shows up on eBay, magic flea markets and auctions. 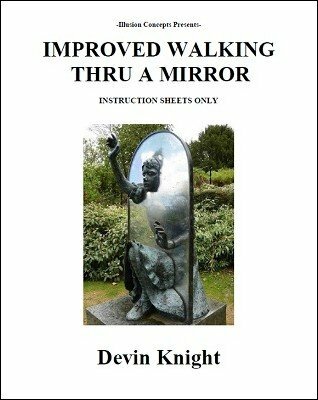 Although not plans, after reading these directions, you should be able to do this illusion using any tall self-standing mirror sold in furniture stores. Effect: This is the standard walking through a mirror effect. It has been manufactured by several different companies. The basic method is the same and these directions will work with most any version you own. The magician stands behind a tall mirror about 24" wide (which is ungimmicked and can be examined) and puts his arms around the mirror. He grabs a cloth on the floor with his hands in full view at the top of the cloth. He pulls the up the cloth and lowers it. Amazingly, he is now standing in front of the mirror! Walking through the mirror happened in just a few seconds. These are some of the best directions ever written for this illusion. The directions cover lighting, angle problems, shadows and the floor and shadows on the back curtain. Valuable information and tips no matter which version you own.